A very simple recipe for a healthy dessert. Pour the juice into a small pan and stir in the kanten. Heat until boiling, then let simmer for a few minutes. Pour into your container shape of choice and leave to set (kanten sets at room temperature). You can also add kuzu to create different texture jelly. Just mix the kuzu with a little water and stir into the kanten/juice mix before simmering for a few minutes. You can also try different flavors of juice; we experimented with apple, grape and orange and all were delicious. 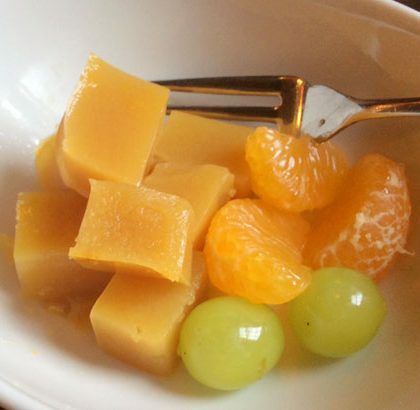 Orange was the tartest flavor and grape the sweetest. 200ml juice + 1tsp kanten + 1/2 tsp kuzu will give you a softer set than just kanten. 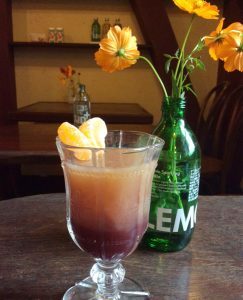 The jelly in the photo was made with a grape juice base with a higher proportion of kanten, and topped with apple juice with a higher proportion of kuzu.